Has NetEnt just won the prize for the strangest title with this release joining the latest online slots available? NRVNA The NXT Xperience slot is an odd one indeed, but does the game live up to the oddness of its name? 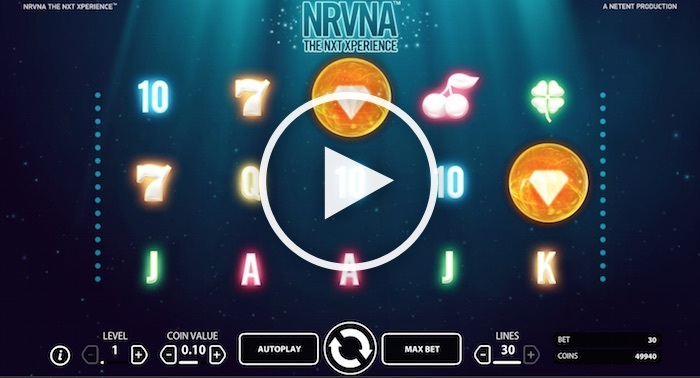 NRVNA The NXT Xperience is a 5 x 3 online slot game hailing from NetEnt. It has 30 paylines and a variety of coin values and choices as you play. It’s not the first futuristic slot game we have seen, but it is definitely the first that has been pared down to such a slick design. The quality of the graphics saves it from being a disappointment. Indeed, you could call it a highly-polished five-reel game of the classic sense. Since it comes from NetEnt, you can rely on it being smooth and pleasant to play. The design is, well… a little basic, especially after you ponder over the mysterious nature of that title. They’re clearly trying to take you into the future, with a screen that looks as though it is either underwater or in outer space. With that said, it does focus your attention in on the symbols and features of the game. All the controls you will need are place at the bottom. You can choose the coin values here, not to mention the bet level you want to play at (i.e. the number of coins to play per line). It’s all fairly self-explanatory and you have the chance to use the autoplay feature as well. When you play NRVNA The NXT Xperience slot, you only need to find the small ‘i’ to the bottom left to access the payout table. It has five pages, one of which is taken up by the arrangement of all 30 paylines. Just use the arrows pointing left and right to navigate your way through the table. When it comes to symbols, well, they are all pretty standard to be honest. The more valuable ones come in the shape of cherries, a 7, a four-leaf clover, a horseshoe and a bell. Every symbol is designed in one colour with a glowing appearance. The cherries pay out the top regular game prize of 2,000 coins for five on a single line. Elsewhere you have the usual K, Q, J, A and 10 to spot. Okay, so this is where the fun really starts. It won’t come as a surprise to learn the NRVNA slot has a wild symbol, which shows up as a star in a purple orb. If you manage to get one of these in a winning line, your prize enjoys a 3x multiplier (quite generous, we think). You get a scatter as well, which incidentally is the one and only symbol the wild won’t replace. This also appears inside an orb – a yellowish-orange one in this case, with the symbol being a diamond. If you spin three or more into position anywhere, they will unlock a round of free games. You’ll get at least 10 if you have three scatters. Four of them will unlock 15 free games and if you manage to find five you are rewarded with 30 free spins. These can be triggered again if you get more scatters during a free game, too. There is one additional feature to watch for as you play through the free spins. The NRVNA Wheel can appear and grant you a multiplier for a prize. This could be as much as 10x your bet. On the other hand, it might bring some extra free spins to enjoy. This could be one or two free spins per appearance. You can start playing from just a penny a line here, and the max coin value is 50p. If you wish, you can use up to 10 coins on each payline. With 50p coins in play and 10 of those per payline, this adds up to a max bet of £150 per spin. Mind you, it’s easy to cover the lot at just 30p per spin too. The max jackpot is 966,000 coins according to the first game screen you see, so the value for prizes with the NRVNA slot varies depending on the bet you placed. However, the best payout would be well into six figures if you had the £5 top line bet in place. Just multiply them to marvel at the potential! Finally, the average RTP looks to be around the 96.7% mark, which is more than acceptable, we think. NRVNA The NXT Xperience slot is worth looking into if you want to play new slots for real money. While it is essentially quite basic as a slot game, the NetEnt NRVNA game is modern and can be played on mobile devices as well as on your desktop or laptop computer. For that reason alone, it is worth a shot.